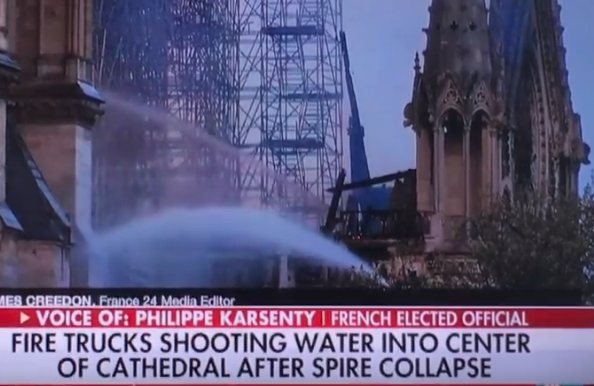 Fox News host Shepard Smith immediately shut down a controversial right-wing French caller’s conspiracy theory suggesting that the Notre Dame Cathedral fire may have been intentionally set. 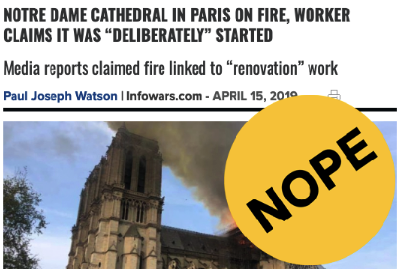 Smith offered a concise and immediate rebuke during live on-air coverage of the Paris cathedral’s burning after Philippe Karsenty, a former right-wing political candidate, floated the idea Notre Dame was set ablaze by potential terrorists. Karsenty was previously sued for libel after he accused the France 2 network of staging the killing of a 12-year-old Palestinian boy, Muhammad al-Durrah, in 2004. But then Karsenty’s phone call with Smith, widely considered one of Fox News’ most moderate voices, descended into uncorroborated causes of the fire that Smith promptly shut down. “No I’m just telling you something that we need to be ready—” Karsenty began, before Smith cut him off and ended their call. The Fox News chyron during Smith’s segment identified Karsenty as a “French elected official,” although it’s unclear if he holds office currently. “We’re watching at least the partial destruction of a world icon. Notre Dame Cathedral has been burning for two and a half hours. The initial reports we got were the fire started at a construction zone in the rear,” Smith explained after ending the call with Karsenty. “We are thousands of miles away, and the man on the phone with us has aboslutely no information, of any kind, about the origin of this fire, and neither do I.